Saab Fighting Wrong Sleepytime Battle - Cars! Cars! Cars! Autoblog reports: Wake up! Saab jumping on the drowsy driver bandwagon. This would have a lot more impact if the Saabs themselves didn't put us to sleep. Oh, wow, a 9-3 wagon! Man, that gets the blood pumpin'. And, look, yawn, a 2001 9-5. Or, yawn, is it a 2007? And is that a 9-7... zzzzzzzzzz. Now Volvo... the C30 and V50 both get us pretty chubbed up. Come on, peoples, tell us the C30 isn't friggin' awesome. It is. That's a snap of the 2008 Volvo C30. So friggin' sweet. Volvos all model's are just great. Mir gefällt es wenn die großen Volvo-Türen mit einem leicht herzhaften Klack ins Schloss fallen, erinnert mich sehr an die Schneewittchensarg-Ära der 70er Jahre. Dieses Gefühl weckt kein Saab, in mir. 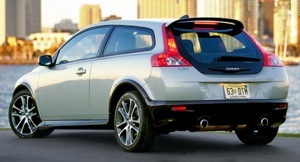 The Volvo C30 is precious, I would buy it.